This little tidbit is useful for families sharing information, businesses sharing reports or meeting agendas, sending recipe files to your friends and so on. But we can't go round sending docs to just anyone, that would create a nightmare of spam. So, how do you do it? 1) The receiver needs to authorize the sender's email. Go to http://amzn.to/mykpage then to "Personal Document Settings"
3) If 3G is being used, set a document price limit (it costs per MB, Mine is set to 15 cents, the low cost for a megabyte). WiFi is free. 4) Scroll up to "Send-to-Kindle E-Mail Settings " and get your Kindle's email address, share it with the sender. Now the sender can email docs to your kindle. You can remove permission at any time. 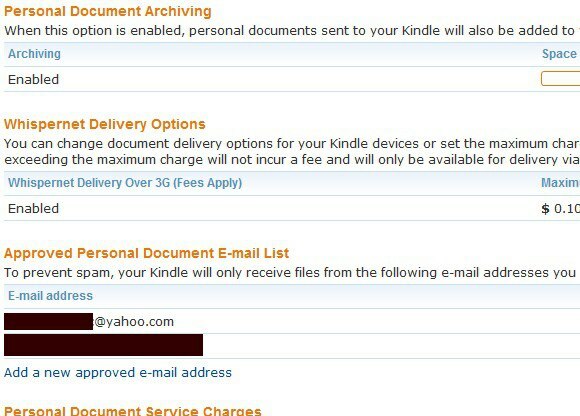 If you are the sender, you can email multiple documents to multiple kindles at once - you will need to be an approved sender - so have the receiver fill out these steps above. Personal documents in supported file formats smaller than 5 MB are typically delivered to your Kindle device within five minutes (per document) if your device is connected wirelessly. Personal documents larger than 5 MB or in some file formats (such as PDF files) may take longer. Your e-mail provider may have additional limitations on file size. The file size of each attached personal document must be 50MB or less (before compression in a ZIP file). The submitted e-mail must contain no more than 25 attached personal documents. The submitted e-mail must target less than 15 distinct Send-to-Kindle e-mail addresses. The attached personal document must be a supported file type. You may send personal documents to your supported devices for your personal, non-commercial use only. You may not send or authorize the sending of documents from automated distribution services. We may limit the volume or number of documents you may send, download, or store. There is no limit on the number of devices that can simultaneously use a single personal document. The above file types can also be combined in a compressed ZIP (.ZIP) file. ZIP files are automatically opened up by the conversion service, converted to the Kindle format if needed, and stored in your Kindle Library. Some complex PDF files might not format correctly on your Kindle or Kindle reading application. If you prefer to have your personal PDF documents converted to the Kindle format so you can take advantage of Kindle functionality such as variable font size, annotation, Text-to-Speech, Whispersync, etc., type "convert" in the subject of the e-mail when you submit your personal document to your Send-to-Kindle e-mail address.